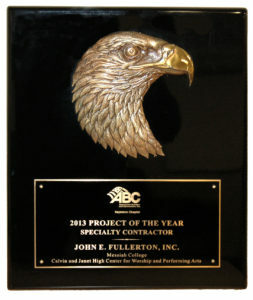 Our team at John E. Fullerton, Inc. has earned distinguished honors for electrical contracting. 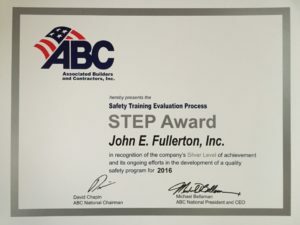 ABC’s Safety Training and Evaluation Process (STEP) program recognizes the efforts of ABC members that strive to achieve effective safety practices at their firms and provides contractors with a tool to objectively evaluate their safety programs, policies, procedures and training. 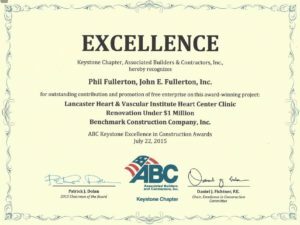 Award given for the project at Lancaster Heart and Vascular Institute Heart Center Clinic in Renovation Under $1 Million. The Calvin & Janet High Center for Worship & Performing Arts at Messiah College has been distinctive from its outset. Many venues are housed within the new building. 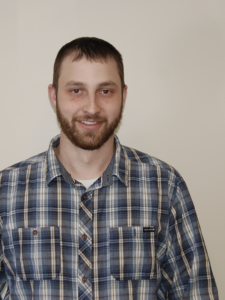 Three Rehearsal Rooms for choir, chamber and instrument practice; a Recital Hall with theater seating for smaller, more intimate performances, the Black Box Theater for small plays, which may also be held in-the-round; and the primary focus of the structure, the Symphony Hall. 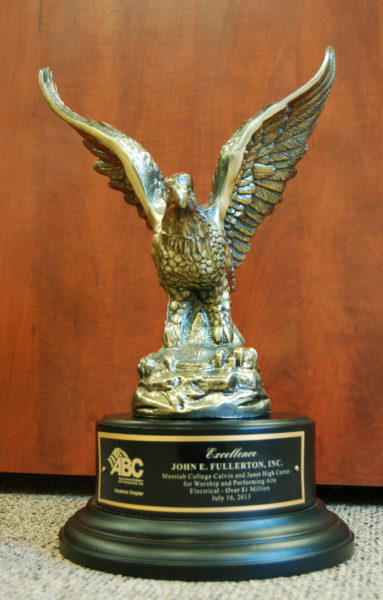 Award given for Messiah College’s Calvin and Janet High Center for Worship and Performing Arts in Cumberland County, PA.
Keegan Reed of John E. Fullerton, Inc. provided three months of training for national ABC craft competition in the electrical/residential/commercial category.